This dirty bird pours a beautiful deep garnet color with a solid, reddish-brown frothy head with outstanding retention and good sticky lacing. 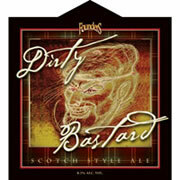 This Scotsman isn't hiding what's under his kilt, as we're smacked with a potent mix of alcohol, sweet malts, and a subdued fresh hop aroma. The first impression is a moderately sweet alcohol with a nice hop presence giving us a bitterness that kicks the sweetness right in the face as the beer matures into a nice, hoppy, smoky finish that tames the alcohol. Medium bodied with a creamy texture, it leaves us a little bit dry and oily and gentle carbonation. This beer is certainly excellent, although with a little more balance with the alcohol up front, we could see it being even better.